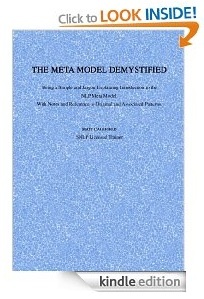 The Meta Model Demystified is a no nonsense primer/revision guide/re-inspirer for you to master one of the most interesting and powerful models in the field of NLP. An understanding of the origins and theory of the Milton Model. A history of the Meta Model – putting it in context. An understanding of basic grammar. A list of the Classic Patterns in an accessible way. Hints and tips to improve your skill at using the Meta Model. Undo and explore your own beliefs and limitations. Get to the root of a problem in seconds, rather than hours going round and round. Build rapport more quickly than ever before. Have a brand new understanding of other models in NLP. Including Sleight of Mouth patterns and the Milton Model. PS, Have you read the ebook? If you enjoyed it I would really appreciate it if you could leave a review on Amazon (if you do, let me know and I will send you a thank you gift). If you have any questions or comments (or notice any embarressing typo’s! ), please let me know. PS, if you like this you may also like my “Advanced Language Pattern Flash Cards”, you can get them here. Is The Meta Model JUST Chunking Down? NLP Videoblog Episode 16: Sleight of Mouth Can NLP Help You Win An Olympic Gold?